Kate Berman has been ‘up and at ’em’ for more than three hours by the time she gets into line at a local coffee shop at 8 a.m. on a recent Friday morning. It’s about a month before November’s Sun Valley Ski Education Foundation Fall Game Dinner. While most people are just starting their day, Berman has already been hard at work jotting down notes and reminders, returning emails and multi-tasking at a championship level. 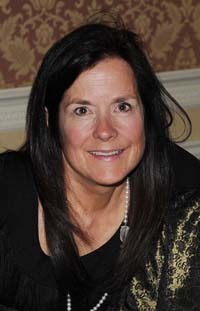 For 13 years, Berman has acted as events director for SVSEF. When it gets a few weeks away from the two gigantic SVSEF fundraisers organized by Berman—the Fall Game Dinner and the Janss Pro Am in the spring—sleep is the one thing that becomes nearly impossible for her. Since the Nov. 10 event is Berman’s last Fall Game Dinner in her current role, the preparations seem all the more important. In the few minutes it takes to foam her latte, Berman greets no fewer than 10 people. All appear somewhere on one of her endless to-do lists—to contact, call back or check in with. She has learned one important thing about the Wood River Valley in the 15 years that she has volunteered and worked with SVSEF. She has been a parent volunteer, board member and now the event director, fundraising and putting on a party. Berman has learned it’s all about relationships. When she is in town asking for donations to support the SVSEF, her reputation and the friendships she has forged are largely responsible for the incredible generosity of local merchants, restaurants and individuals. Berman insists that it’s the mission and reputation of SVSEF that does the talking, not her. The organization provides year-round ski and snowboard training and competition opportunities for 500 Wood River Valley athletes. It was incorporated in 1966, three years after the Sun Valley Ski Club founded a junior alpine racing program. Berman understands the impact first-hand because of her family with husband Andy Berman. Her children, Riley, 21, and Sara, 24, benefited tremendously from their years as SVSEF athletes. Sara was a turquoise-clad first-grader when, very grudgingly, she took her first turns with the Development Team. Skeptical at first, Sara came down from the hill on that first day thanking her mother for “making me do this.” She was on board from that moment on. Kate Berman, like so many parents in the valley, stepped up and stepped into roles where she could make a difference—when it became evident that the SVSEF was going to be an important part of her children’s lives. At first she helped with the Hobson Memorial kids race and volunteered where she was needed. In 2000, Berman was asked to join the board of SVSEF. Her talents, organizational skills and creativity led to an appointment as event director. The SVSEF Fall Game Dinner on Nov. 10 in Sun Valley’s Limelight Room is like Berman’s third child. It has grown up with her and benefited from her nurturing, patience and creativity. Berman’s belief in the importance of the SVSEF to the community was a factor in her decision. She took the job, in large part because she felt her support in fundraising could support the SVSEF’s overall mission. At the time, the ‘job’ consisted of a shoebox with years of old Game Dinner programs and a directive to build a database from that information. Rufus Brown, a former SVSEF board president and active supporter, said, “Kate may not have known how to ‘plan’ an event when she took the job. She definitely didn’t know how to use a computer. But Kate knew how to throw an amazing party. The job and the event itself grew with Berman. The first Fall Game Dinners, before Berman’s time, were potluck affairs. They brought the SVSEF community together in the fall slack season for a meal and some lively conversation. Local hunters, often SVSEF parents, donated game that was prepared by Michel Rudigoz and other local chefs. Now in its 36th year, the Game Dinner has come a long way from its humble roots. Attendance has skyrocketed, with as many as 400 people expected at this year’s event. It is a dress-up affair in a dress-down town, and something many party-goers look forward to each year. The evening features silent and live auctions along with a “mystery balloon raffle,” a little tricky this year with the worldwide helium shortage, but Berman is on it. A highlight of the dinner is the Jack Simpson Dedicated Coaches Award, which goes to an SVSEF coach who has made a major impact on the development of the student-athletes. Wiseman said the Game Dinner has become a legacy. Berman extends an invitation to everyone to participate, either by donating an item or attending the evening. The response is usually overwhelming. She and her “wonderful-can’t-say-enough-amazing-things-about-them” volunteer team of hundreds of parents and friends help make the night one to remember. The Janss Pro Am on Baldy from April 4-6 will be Berman’s last official hurrah. Called the “best party on snow,” the Janss Pro Am is also like one of her children. Berman began to theme the Janss events, turning the fundraiser into a three-day costume party that is by all accounts fun. Whatever you do, don’t say Kate Berman is “retiring” in April. Even if she wanted to, it seems impossible that she could. She plans to pursue her passion for horses, something that has been put on the back burner while raising her children and committing countless hours to SVSEF. Berman is particularly interested in therapeutic riding programs. Meanwhile, the buildup to Berman’s final Fall Game Dinner is a bittersweet time for the SVSEF. Yet she’s confident the work she has put into growing SVSEF fundraising events will continue without her at the helm. “I am so passionate about this organization that I am replacing myself before I go!” she said with a laugh. She has been training Sarah Crowley as the new events director. Bu first she has to make sure this year’s Game Dinner is a success. Coffee in hand, she heads back to work, gathering the pieces necessary to properly promote and display the silent auction items, processing donation forms and checking in on the event’s famous goose centerpieces. Busy is how Berman likes things. She is in her element. Tickets to the Fall Game Dinner are now available and are less expensive the earlier they’re purchased. More information is available online at www.svsef.org. Online bidding opens Thursday, Nov. 1, at www.svsef.maestroweb.com.